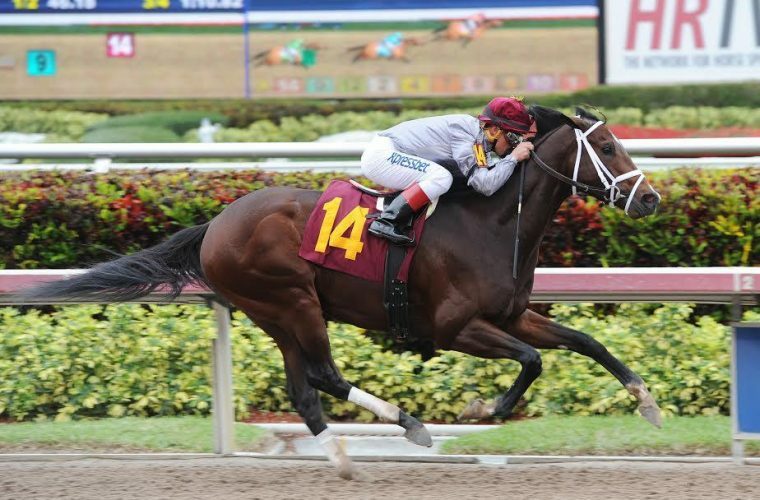 Khozan, the royally bred son of Distorted Humor who caught the horse racing world’s attention with two impressive victories last winter at Gulfstream Park has been retired and will enter stud this coming year at Brent and Crystal Fernung’s Journeyman Stud in Ocala. Purchased by Bradley Weisbord for Al Shaqab Racing for $1 million at the 2014 Fasig-Tipton Florida select 2-year-olds in training sale, Khozan won at first asking for trainer Todd Pletcher at Gulfstream last January, easily defeating a group of maiden runners by four lengths. After his maiden win, he returned a month later to win his next start in a facile manner, taking a on-mile allowance race by 12 3/4 lengths. Khozan suffered an injury in his last work out prior to the Besilu Stables Florida Derby (gr. I), which ultimately led to his retirement. “It is heartbreaking Khozan was never able to show his full potential, Journeyman Stud will offer him the opportunity to carry on his legacy on the breed”, said Weisbord. Khozan, a half-brother to champion race mare and two-time Breeders’ Cup winner Royal Delta, is out of graded stakes winner Delta Princess. Delta Princess is also the dam of grade I winner Crown Queen and two other graded stakes horses from six foals to race. Delta Princess sold to Adena Springs for $2.8 million dollars carrying Khozan at the Keeneland November 2011 breeding stock sale. She was euthanized Aug. 5 of 2014 because of a degenerative stifle condition. Florida breeders will have their first opportunity to inspect Khozan at Journeyman’s open house Dec.5.